I’m actually super psyched about my Autumn Almond Pear Granola. I’ve gotten into to the habit of making a new, somewhat seasonal granola every few weeks, but this one hit all the spots for me. It’s just a little sweeter than some of my granolas and the slightly crunchy, caramelized oats are a beautiful thing. It’s the dried pears though, that really takes it over the top and they’re beautiful with the almonds. There’s just something about the dried pears in this Autumn Almond Pear Granola that makes it so much fun to eat. Some are a little darker and almost like sweet little flavor bombs, others remained a bit lighter and just a bit chewy. And like most my granolas, Autumn Almond Pear Granola has almonds (I’m always trying to eat those 10 healthy almonds every day) and almonds are such a great pairing with pears. Usually, I just use whole almonds, pulsed in the food processor, skin and all in my granolas but as I was going through my stash of nuts, I found a package of slivered blanched almonds. While my brain said save those for your fall baking something made me toss them in my granola, instead. That made this such a beautiful light and almost delicate granola, and the bit of extra honey gave it gorgeous clusters. And that inspired me to steal some of it away for my Epic Pear Almond Granola French Toast. And so you know, that is a pretty much over the top, decadent Pear Almond Granola French Toast with a Pear Brown Sugar Caramel Syrup and a dollop of Mascarpone. I’m super psyched about it because it’s the perfect fall French toast for the perfect crunchy leaves kinda fall day I know is coming! So stay tuned for those recipes! In the meantime, make the Autumn Almond Pear Granola, because whether you make the French toast or not, the granola stands on its own as an absolutely delish (if somewhat healthier) fall breakfast. Granolas like this are super easy to make and pretty quick, too. They’re really nothing to toss together and this one takes just 20 minutes in the oven to toast everything up. It’s the kind of recipe that’s so simple you can toss it together while you’re cleaning up the kitchen after dinner, or maybe when you’re just hanging around the house. There was one thing that really was a bit of a pain in the patootie to do with my Autumn Almond Pear Granola. The dried pears were huge and I tried cutting those into pieces, but finally ended up using scissors to cut them into little chunks a little less than 1/2″ big. Maybe about 3/8’s of an inch. It did take a bit of patience! If you’re not familiar with displacement measuring, for this recipe, add 1/2 cup of cold water to a 1 cup glass measuring cup. Add spoonfuls of the coconut oil to the water until the water level comes up to one cup. When you drain it, the water just sloughs off and you’re left with 1/2 cup of coconut oil. My son’s girlfriend, Tweety, standing next to the trunk of the willow. It’s hard to tell but she really had to climb through a lot of brush and branches to get down there! I didn’t notice the leaves had popped over her face!! As far as cost, oats are really dirt cheap (and healthy, too!) and I used the Quaker Old-Fashioned. They’re generally on sale in the early fall and that’s when you’ll find coupons. Supply & demand, right? The harvest’s over and the warehouses full. Stock up, because the new harvest won’t start coming in until the following May. If I don’t go with the quaker, the Aldi brand is really good, too. I was actually impressed with a side by side Quaker to Aldi comparison. As far as almonds go, any nut is going to be at the lowest price of the year late fall and around the Christmas sales, and almonds stay fresh, tightly wrapped, in the freezer for months. If you don’t buy then, check Aldi and Costco. The prices at both places are close. I did choose to use the slivered, blanched almonds in this granola and they are a little pricier than the whole almonds. Either would be good, though. The dried pears I just picked up at the bulk bin of my grocery, but not before I compared them to the packages in the produce department. They weren’t the cheapest item but it didn’t take many to make this granola, either. I’m super psyched about the fall flavors in Autumn Almond Pear Granola and I think you will be, too! Easy to make, healthy & so delish. To a large bowl, add oats, almonds, and pears. Mix, then drizzle with the honey mixture and mix again until all is coated. Turn out onto two sheet pans. 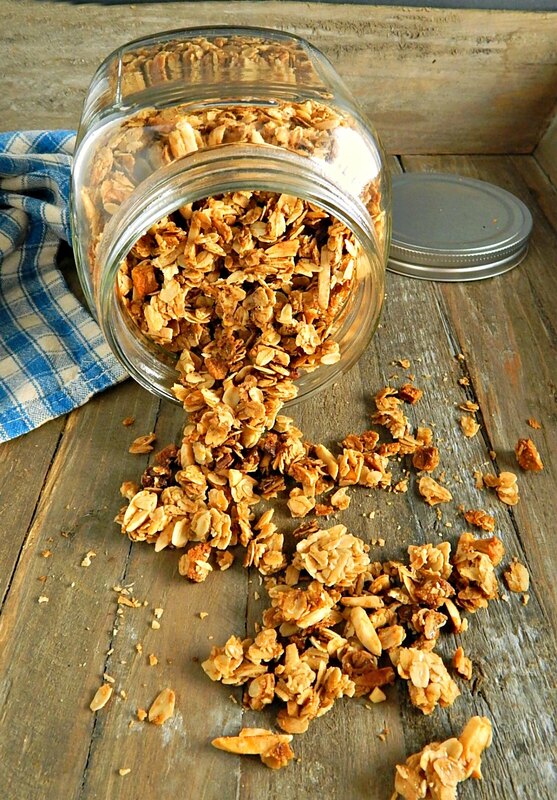 Watch this granola carefully towards the end of the cooking time. You don’t want the pears to get too dark. If any pears have gotten too dark, especially on the edges, remove them; they can be bitter. I’ll be sharing Autumn Almond Pear Granola at Fiesta Friday #242, cohosted this week by Jhuls @ The Not So Creative Cook and Jen @ Apply To Face Blog. You’re going to love all the bloggers that share their best recipes of the week at Fiesta Friday but do drop by and see Jhuls & Jen. You’re going to love Jhul’s creative recipes and Jen is going to have you in stitches with a helping of her real-life stories along with each recipe. This entry was posted in Click here for Fabulous Food Posts and tagged Almonds, Breakfast or Brunch Dish, Cereal, Coconut oil, Dried Fruit, dried pears, Granola, Honey, Oatmeal. Bookmark the permalink. Oh gosh, I just gave you an update on my trees on your last comment! No the pears kind of dry out. Funny, I have always put in my fruit with the oatmeal. Strange, I never thought to do it after! Well except raisins. I’ll let you know how it comes out here. xo Mollie. Thanks Jhuls, and thanks for hosting for us this week! I love oatmeal – a lot! It’s so healthy so I’m always liking new recipes for it! I seem to come alive again and have so much more energy during the fall!